Iris and Will Griffith had a whirlwind romance and, from all appearances, an idyllic marriage. Even after seven years of marriage, they seemed to still be head-over-heels in love with each other. Iris knows that Will loves her and thinks she knows everything about her husband and his past until that fateful day when he takes a plane and it subsequently crashes killing everyone aboard. The first question raised is why was Will on a plane to Seattle when he told her he was going to Orlando? This is followed by why did he lie to his assistant and say that he and Iris were on vacation in Mexico? What was in Seattle and why would Will be going there? The more questions Iris obtains answers to the more questions are raised until she finally realizes she didn't really know her husband at all. Initially, Iris is in a state of denial that her husband could be on the flight to Seattle. Then she's in denial that he actually died in the crash. Her denial quickly becomes mass confusion when she's faced with a past that Will had not only hidden but lied about his past. She doesn't really know any of his friends or acquaintances except a few people from work until she meets a gym buddy at the memorial service, Corban Hayes. Just when Iris thinks she's come to grips with Will's past and demise, Will's boss confronts her with the fact that Will had embezzled millions of dollars from their company. If that's not bad enough, she's receiving suspicious and taunting text messages. Will Iris be able to uncover the truth about Will before it's too late? 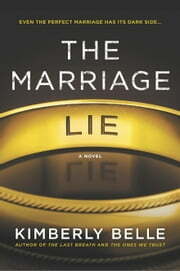 I began reading The Marriage Lie while sitting in a hospital surgery waiting room during a relative's recent procedure. The only reason I put this book down was because the procedure ended (it went well) and my relative was discharged from the hospital (kind of difficult, not to mention tacky, to continue reading during the discharge, etc.). I picked up the book a few hours later and didn't set it aside again until the final page. Ms. Belle took this reader on one heck of a ride with this story. There were so many twists and turns I thought I might need motion sickness meds (not really, but you get the point). I can only liken this story to a reverse nesting doll where instead of dolls getting smaller the lies being revealed actually get larger and more confusing. Just when you think it can't get any more confusing, yes — you guessed it, but Ms. Belle takes that confusion and neatly wraps it up with a surprise ending (no, I'm not going to tell you what happened, read the book!). 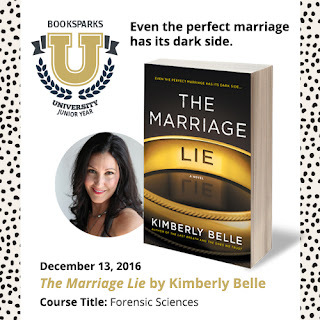 The Marriage Lie is an amazing read and one that I found to be fast-paced and enjoyable from beginning to end. As a former Atlanta resident, it was nice to revisit some of the places I knew and loved. I may never be able to think of the Atlanta Botanical Gardens quite the same way again, but I'm glad she took such a unique spot and incorporated it into the story. The Marriage Lie provides phantom bad guys (not to mention real bad guys) and that made it even more realistic for me, especially in this high-tech and connected world we live in today. 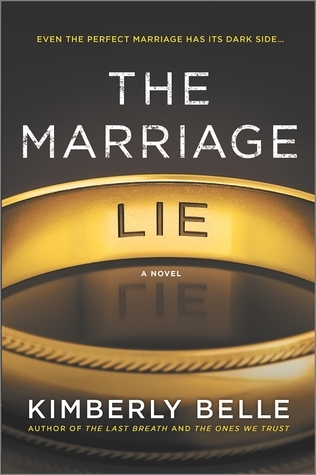 If you enjoy reading suspense thrillers or just want a read that will keep you on the edge of your seat, then grab a copy of The Marriage Lie to read. I enjoyed The Marriage Lie so much that I've added Ms. Belle's previous titles to my TBR list.